All the Dodge fan boys should rejoice as the big old Hemi is getting a supercharger and upwards of 600 HP. It even will have a choice of an 8 speed auto or a 6 speed manual trans. My instincts tell me that the 8 speed might be the quickest and most durable way to go. In any case, with its good design and large displacement, the supercharged Hemi should be a real force to reckon with. It seems that perhaps it was premature to think that the old '03-'04 Terminators might mark the end of an era, since the HP race is apparently far from over, and 600+ HP, stock, vehicles are all over the place. What do those things weight though? I thought they were porky. Plus, how much will they be asking (Sticker + Dealer Adjustment BS) ? That Camaro ZL1 I think is the closest in weight and power to your typical lightly modded Termi. And despite the big numbers on paper, I've outright slayed all of them that I have ever lined up with. That may be a traction issue on their side, but I thought I ran one with some good DR's at Willow before and it just couldn't get out of the hole, though it did have decent mph. May be that a "Driver Mod" is in order as well. But, my old bucket, at close to 3900 lbs with me in it, putting 500/500 to the wheels (580-ish crank?) , with most of us paying around $30k new, or near new is still the budget performance machine to beat. Not sure if it ever will. But, at the end of the day, it is just an old Foxbody, with no NAV / Sat Radio or any of those fancy modern features. Craparo can have a supercharged 427 and Dodge a supercharged 392 Hemi. All those cubes compared to the mere 280 for a Termi have to more than compensate for the relatively small curb weight difference. And, if you are comparing modded Terminators to the others, one has to wonder what will be gained with tunes and more boost on the bigger machines? If a Termi makes 500/500, a 382 Hemi would make 700/700 in exactly the same state of tune, and a 427 would make 762.5/762.5. There is no replacement for displacement! Brakelate wrote: What do those things weight though? I thought they were porky. Plus, how much will they be asking (Sticker + Dealer Adjustment BS) ? Hmmm... I've never been a Dodge fan, but sounds like they put some serious effort into the car. Good for them. Yes, wonder what it costs? Wonder about the weight? Wonder how many? Could it be? Something that a Termy does not want to come up against? I guess after 12 years it was bound to happen, but it is still a show car for now "
"Production of the most powerful Challenger will kick off during the third quarter of 2014 at Chrysler's Brampton, Ontario factory. Expect pricing information to be released closer to launch." We will see. Well, I liked the early Dodges, and even hoped they would "bring it" when they brought back the Challenger. But, it didn't happen, and all the electronic BS with traction control, nannies and other things that could not totally be shut off killed it for me. Glad to see this package. 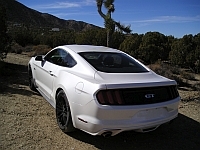 If nothing else, it might motivate Ford to keep moving forward with the Mustang / Cobra / Shelby / Bullitt / Boss / or whatever. That last generation Z06 could be a hand full for a Termi on a high speed road course if driven properly. But, in all the drags I've done, and even some freeway roll on's, they just don't add up, regardless of what the power to weight ratios would indicate. That is only amplified in the newest Camaro's. Especially from a standing start. Again, it may be driver inexperience. But there has to be some old school Chebby pilots out there that can launch these things (?) Still, so far, I haven't had a problem slaying them. But, as these numbers keep climbing, the margin for error or sloppy driving keeps shrinking. The latest stock Coyote and early 5.0's with a tune prove that out. A 500/500 Termi is not the hands down clear winner it used to be. Bad tires, or the slightest jump can create a margin that is hard, if not impossible to make back up. I'm not scared YET. Concerned? Perhaps.